End your week with the slugfests your heart desires! On a related note, I bought Injustice: Gods Among Us and it turns out I am atrociously bad at fighting games. Maybe today’ll be good just because after the last two hours of my life, it’ll be nice to see the good guy win once in a while. 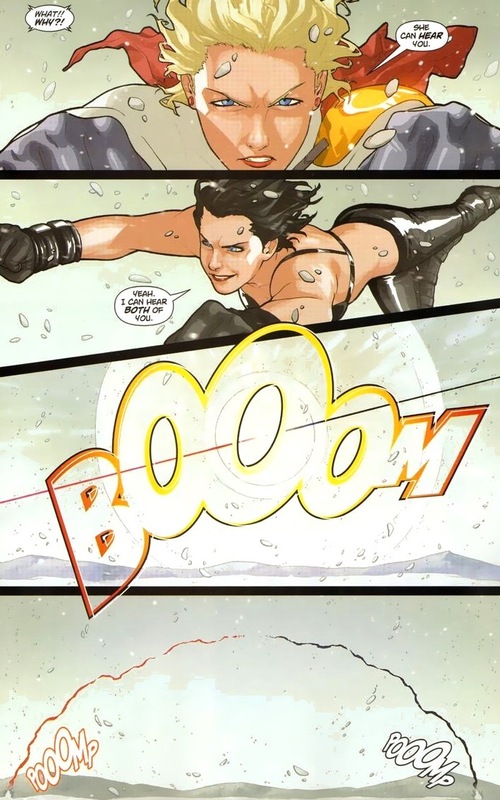 To recap Wednesday’s article, go read the Power Girl series that started in 2009 and ended right before the DC reboot. It’s worth every penny and every moment of your time. We’ll check out a some fights from Power Girl #11, written by Justin Gray & Jimmy Palmiotti and drawn by Amanda Conner as well as Power Girl #16-19, written by Judd Winick and drawn by Sami Basri. 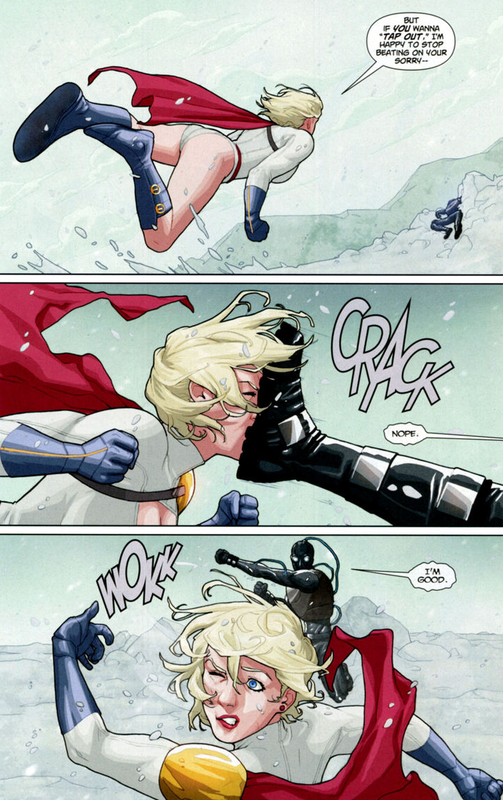 Look, I understand that a lot of the battles I’m showing you start with Power Girl getting her smacked in the head. It’s a common theme. Unconventional, but you can’t argue with results. To be fair to the robot, even machines can’t survive a direct hit in the lower region when the person attacking has the power to dropkick small moons in half. Luckily, the next fight is far more even. Like perfectly 100% even. Right? 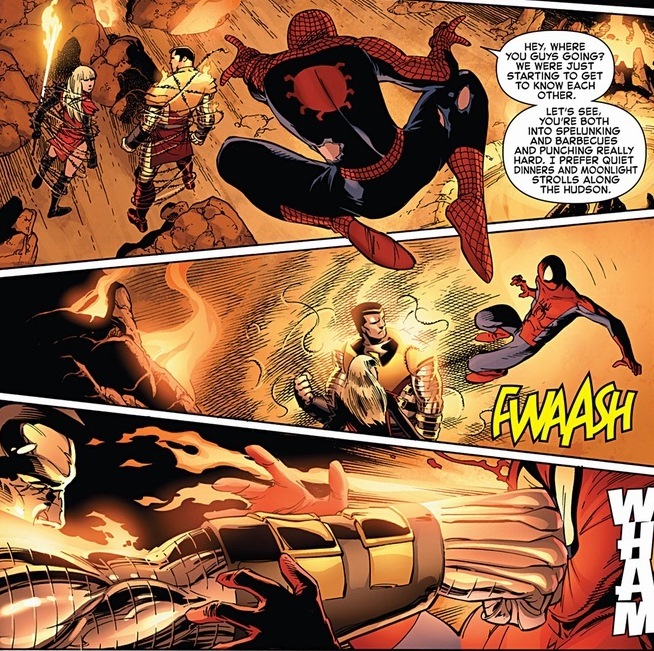 That’s a Phoenix-enhanced super strong literal man of steel destroying Spider-Man’s face, which is protected solely by his nose and a thin layer of spandex. Actually, the whole issue was universally critically acclaimed. For a series about heroes fighting heroes, it was ironically the first time a hero actually acted heroic. Mainly because Spider-Man’s great and awesome and I’m very biased. 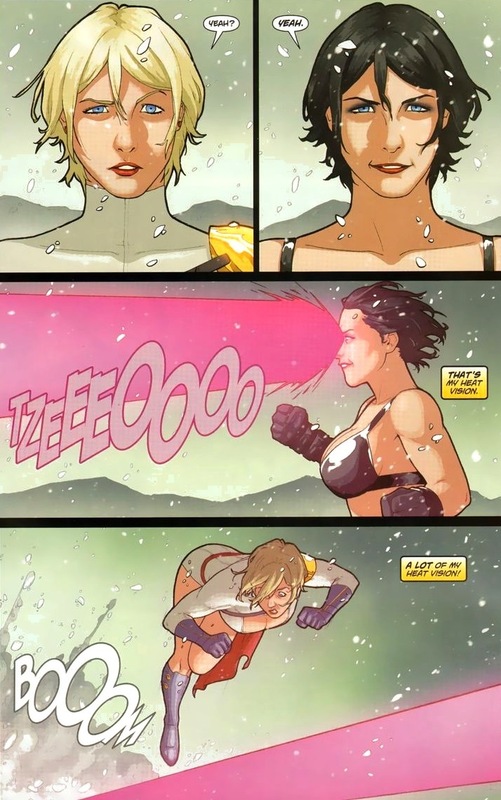 Back to our story, Power Girl starts to gain the advantage. Never fun to fight clones. I know, because I’ve been playing Injustice: Gods Among Us. Whichever character I control, the computer does a spectacularly better job at. 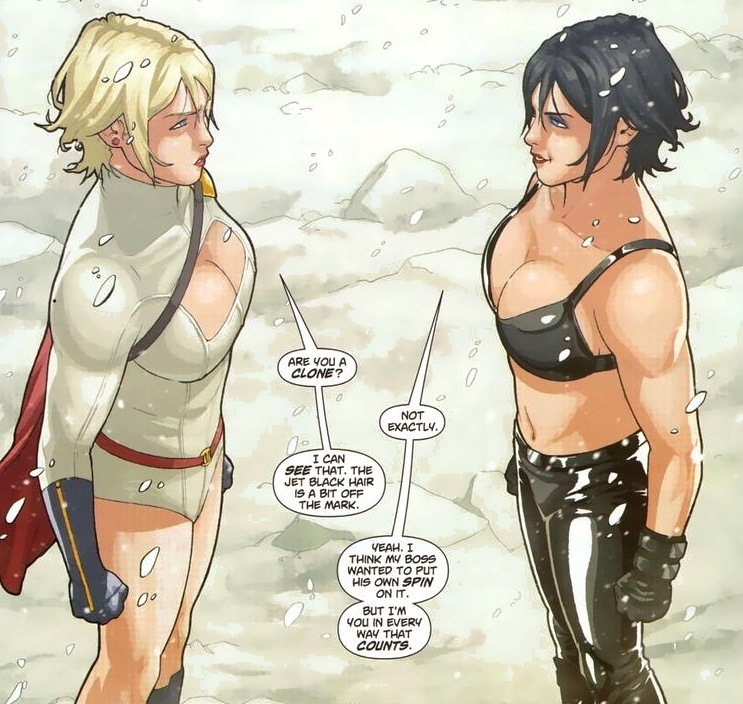 But when Power Girl battles her clone, who’s surprisingly even more scantily clad than the original, Power Girl fortunately knows herself better than the test tube creation does. Years of trial and error, I guess. Once again, the perfect art makes the fight scene so much better. You can read the issue for the rest of the fight, but it’s a lot of what you expect from mad scientists and creepy Power Girl baby factories. 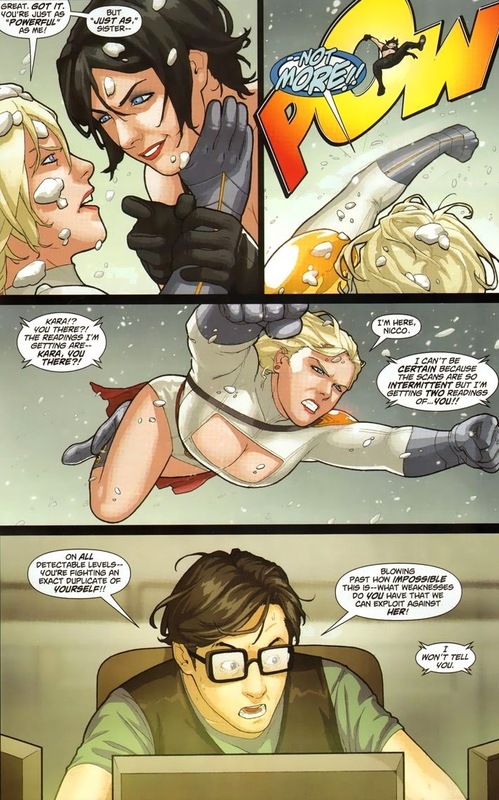 Y’know, I just thought of this, but Power Girl doesn’t really do a lot of dating. I mean, she’s six feet tall, charming, rich, successful, and can juggle large trucks. Are other characters intimidated? Actually, female superheroes seem to date way less than their male counterparts. I’ve covered stories where Ms. Marvel and Spider-Woman complain about not going on dates in months, Power Girl doesn’t get anything even close to a significant other her entire series, and Super Girl dated her horse in the 1960s (which I’ll never let you forget). Do superheroines have to be either super promiscuous or completely chaste? That’s a topic for people way smarter and far braver than I am. I think the X-Men get around though. 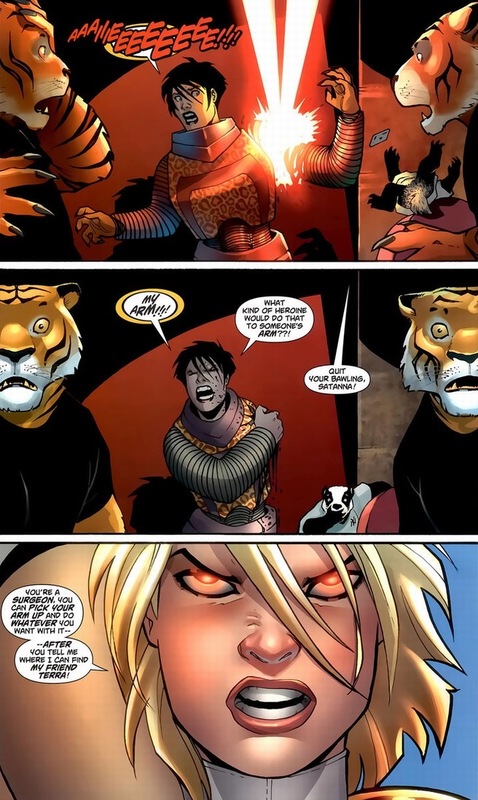 Anyway, we go back eight issues to the time Power Girl’s teenage sidekick Terra got her brain swapped with the supervillain and albino gorilla Ultra-Humanite. Long story. 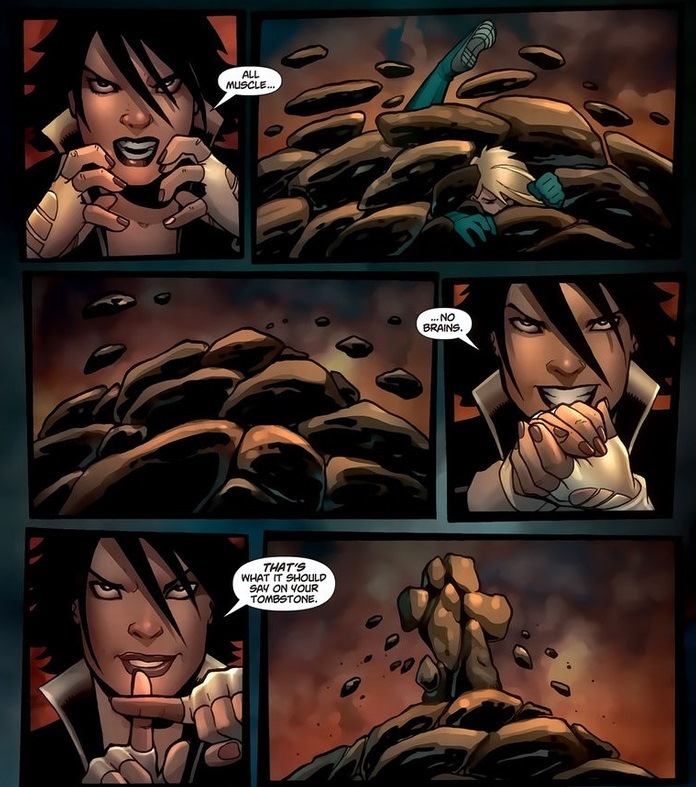 Terra has the power to control the elements and earth and stuff. 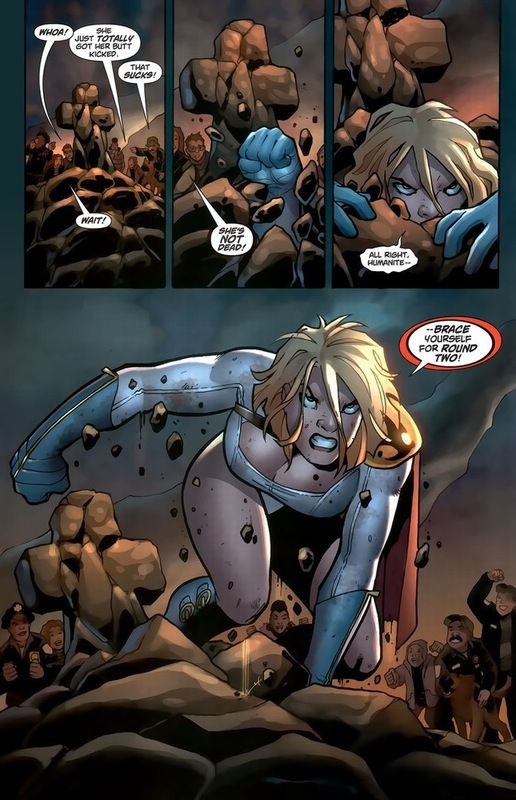 The best reason to include this battle remains Power Girl’s crazy dramatic entrance as she rises from her rocky tombstone, angry and vengeful. Nothing scarier than those red glowing eyes. That’s when you know the Superman family means business. At least scarier than an unconscious teenage girl slumped over a shoulder.